After a long time of steady (and silent) price increases, Pizza Company has come out with a one month offer of BUY 1 GET 1 FREE Pizza valid from 26 February 2009 till 31 March 2009. So those of us who have been tightening our purse strings and vowed not to order pizzas for at least 6 months can take a break from the vow this month and take advantage of the offer. 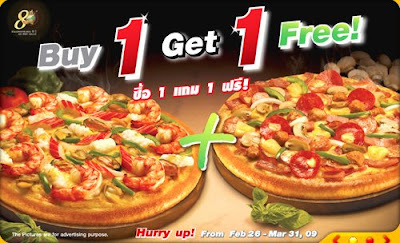 The deal is valid for pizzas over 275 baht which doesn't matter as there are hardly any pizzas below that price level. So what are you waiting for? Just Dial 1112.